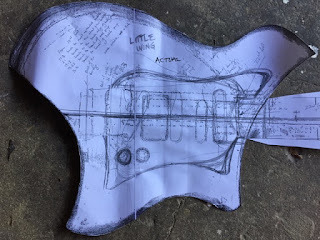 The idea behind Little Wing was to design a unique looking guitar that still kept the playing feel of a Strat. 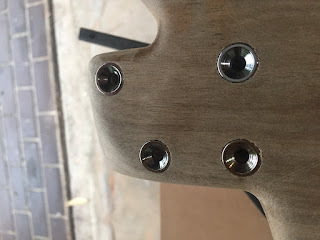 The success of the Statocaster is a testament to the brilliance of Leo Fender and I wanted to maintain some of the key features of the Strat, but I didn't want to build "just another Strat copy." 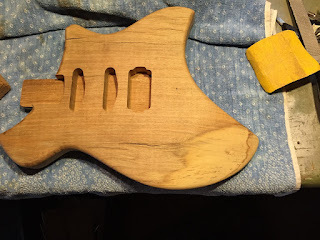 There had to be a contoured face for the forearm, a cutaway for the ribs an when the guitar was played sitting down, the knee rest should put the strings and bridge in roughly the same place as they would be if you were playing a Strat. 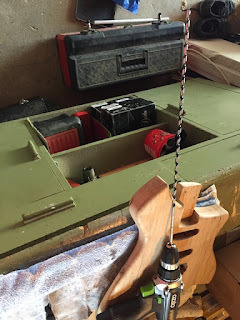 The pickup configuration for me has always been based on a 3 pickup Strat and my goto pickup is the middle pickup. I find the bridge pickup too thin so I've switched that out for a humbucker as I never use the single coil bridge pickup. I rarely use the neck pickup other than for noodling so a single coil works best for me there too. I drew the body template into a sketch pad and continued to make adjustments until the shape looked about right. Then I photocopied and enlarged the design across two A3 sheets until the size was right. 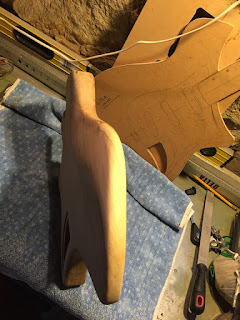 At that point the rough outlines could be smoothed to form the final shape. I traced the shape onto 9mm MDF and cut that out with a jigsaw using a rasp and file to smooth the outline of the template. 9mm provides a sufficient guide when using the router. Finally I sanded the edges to ensure that the curves were smooth to the feel. 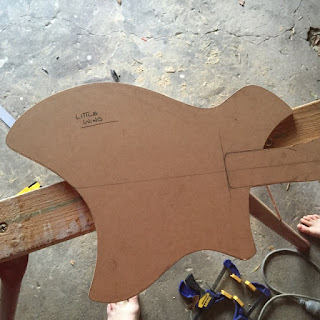 The finished template for "Little Wing"
The body wood was salvaged from and old table, slightly concave on one side, and slightly convex on the other. The wood was partially covered in silver paint, and there are visible surface cracks in the wood which hopefully will sand out once the body shape nears completion. The underside of the table top. The two gouges are where the legs were once attached. 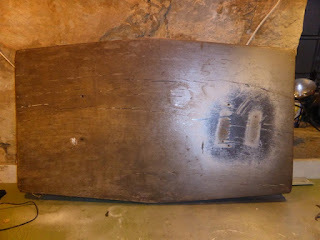 The underside was bowed but the template had to be placed on this side so that the template missed the gouges. I wanted the underside of the table to be the back of the body, making sure the grain travelled lengthways along the body. 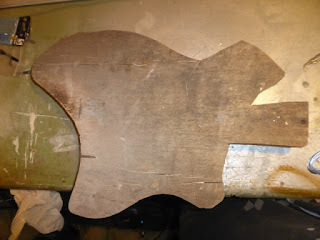 I traced around the template and used a hand-held jigsaw to cut the shape out. That took some time with a coarse, fast cutting blade because its a bloody thick piece of wood. The first picture shows the back, the second shows the front. Not exactly a work of art yet... You can see some surface cracks but luckily, I missed most of them. First I drilled a couple of pilot holes through the templates and into the body, one at the point where the middle bridge screw will be and a couple in the rough beyond where the neck will finish. These holes allow a centre line to be redrawn if the centre line gets sanded off. This turned out to be a great idea. The surface of the top was very rough...with significant cracks. Neither side of the body was actually flat, the top being bowed slightly and the underside lumpy. I started with the underside. 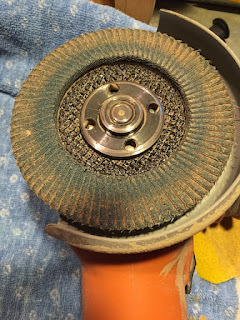 My first attempt to smooth the base with a power planer that was a little past its prime, was a disaster. Deep, rutted grooves appeared where the blade dug in over the rough surface. So I rigged up a makeshift "thicknesser" by nailing two boards that I knew were flat onto two blocks that I knew where the same height. A sheet of 9 mm MDF held it all together. The body was attached to a base board by a screw through the neck excess and double sided tape at the other end. 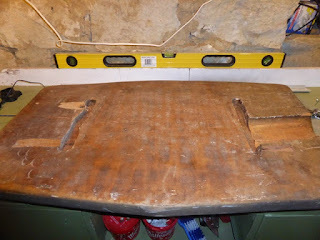 The base board then slid between the supports, moving the body underneath the routing window of the guide boards. Using a wide, flat bit, all I had to do was move the router back and forth over the guide boards as the bit cut into the surface of the body. The gap between the guides was about 100 mm, the bit was about 22mm wide so I got about 4 passes before I had to move the base. Once I'd done the underside, I flipped the body over and did the top. Awesome! Perfectly flat! That worked even better than I thought it would! 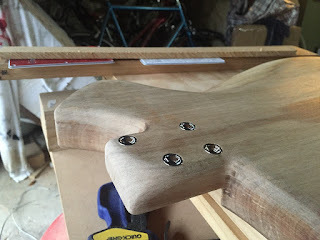 All up I took a little over 7 mm off the thickness to bring it back in line with the body thickness of a Strat. Cracks are still visible but not a big deal. In fact I kind of like the look. 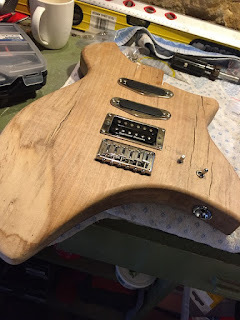 Next step was to route for the neck and pickups. Using a template that I made earlier, I aligned the template with the pilot holes attached the template to the body. The depth of the pickup routes was deeper than the neck and not super critical as long as there was enough space for the pickup. The depth of the neck was critical. The first route used the template as a guide, the rest was done using the cavity as a guide to route out to depth. The blade on the router bit was only about 20mm deep. 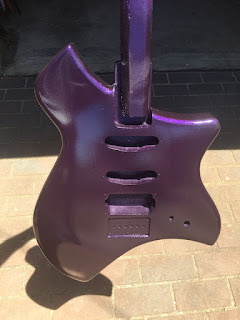 The end result was starting to actually look like a guitar. The next step was to route around the shape itself. This took three goes to get the full depth done, two steps with the bit with the bearing on top, first tracing around the template, then tracing around the body itself. Finally, one pass with a bit with the bearing on the bottom from the underside. Good quality bits make a HUGE difference, the cheaper bits tending to rip rather than cut. The edges needed a final sand but a lot of the difficult routing bits are done. From here I had to finish the neck pocket, round the edges and route the control recess. 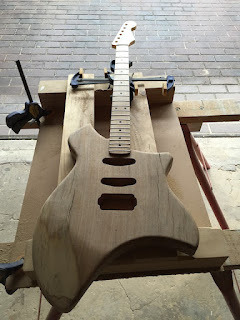 While routing the body edges, the bit nearly chewed into the neck pocket had I not realised at the last moment. Routing is a VERY easy thing to mess up. As you move past the body there is nothing for the bearing to run against and the bit will cut straight into the neck pocket. That was a close shave. Don't try and route the whole thing in one go. Cutting a medium amount of wood out multiple times is far better than plunging in and trying to route the whole thing at once. I drilled out as much wood as I could with a Forstner bit prior to routing, to save the router bit. Hold on tight, the router can kick. When you want to stop, move the bit off the edge of the job and release the trigger. Let the bit stop before trying to lift the router from the job otherwise you'll gouge out chunks for sure as you try to lift the still spinning bit off the job. Find the way the router wants to go relative to the grain and go that way. Don't fight the router. Always unplug the router before changing bits! My router is a plunge router and you have to be The Mighty Thor to be able to control the plunge because the springs are quite stiff. 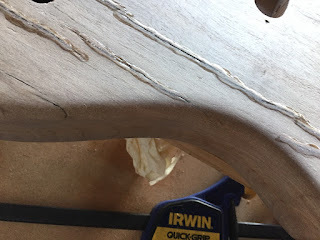 So I lock the router in the down position and slowly lower the bit into the work by keeping one edge of the router base on the job and lower the bit in that way. That's one less thing to think about while routing. Otherwise, if the router slips up on the springs you stand an excellent change of gouging a huge chunk out of the job and template. I learned that the hard way. Use the best quality, sharpest router bits you can find. The picture shows how close I came to gouging into the neck pocket. The wood in one section is almost see through. Once I was happy with the stub, I ran the router bearing along the edge of the stub to cut away the excess below. The excess at the end of the neck pocket was just enough to support the router so I could complete the side routes. Then I measured the length of the neck pocket and cut the end off with a jigsaw running along a fence for a straight cut. 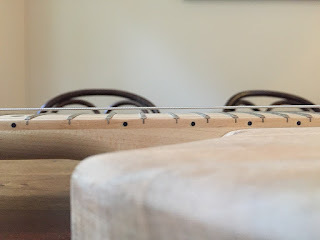 The neck fit in beautifully with maybe half a mil gap between the underside of the fretboard and the surface of the body. Booyah! The next route was the control cavity. I didn't want to use a pickguard so I had to route a hole out of the back. I started by cutting out a section of the body template that would house the controls. Then I clamped the template to the body and used a Forstner bit to remove as much wood as I could then routed out the rest. The control cavity had to be to a depth within about 7mm of the front surface as that's about the length of the shaft on a standard pot and switch. That section of the work was measured 10 times and cut once. The photo to the left is pre-route/post-Forstner. BTW, you can see I'm still using the "thicknesser". It's been super useful and has become my new work bench. You can clamp all over it, it's stable and it's flat. Best thing I've ever made. To cover the control cavity I wanted to create a custom control plate cover and recess that into the back (because there are far more ways to completely destroy the body that way...) so I drew a shape that would cover the control cavity with about a 5mm gap around all the edges. I cut that shape out of some 9mm scrap MDF and smoothed it with sandpaper. The corners were rough but the router bit's bearing would define those anyway. The creation of the template was a bit awkward as the controls are located on the top and you obviously have to route from the bottom. Maybe I should have drilled the control holes from the top all the way through and then designed the control route around that. 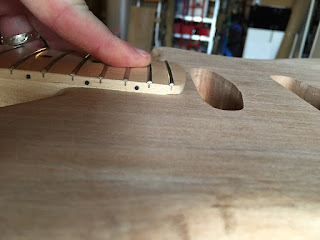 Once I'd routed the cavity I drilled pilot holes from the bottom through the top and then drilled the final holes from the top through to the bottom. I sat the control cover template on two pieces of wood so that I could run the router around the edge of the template while the bit barely touched the surface of the body. The bearing is at the top of the bit and the bit is about 20mm deep. I only need to route out a depth of about 2mm so I dropped the bearing about 2mm into the template. The picture on the left shows the routing sandwich. Template on top, nailed into two spacer blocks, clamped to the body. The picture on the right shows the view from above, through the template, post-route. The finished control cavity. Very happy. I gaffed the plate to the control cover routing template, making sure it couldn't move. Unfortunately, I gaffed the back plate the wrong way around (twice...) and damaged the protective plastic cover on the plate. Having finally correctly gaffed the plate, I scored the plate with an Exacto knife by following the edges of the template. I ran around the template a number of times CAREFULLY so there could be no doubt where the line was. I didn't worry too much about the corners. I used a jigsaw to cut around the outline then used a Dremel on a slow speed with a sanding bit to sand the plate back to the scored outline. When I was close, I hand sanded the plate edges smooth and slowly and patiently, made slight adjustments until the plate fit into the cavity. The completed control route and cover. A couple of drill holes and it's done. Stoked with that outcome. To shape in the contours I took to the body with a sanding flap disk on the angle grinder. Quite brutal but very effective in removing wood quickly especially considering this was not a soft piece of wood! I had to be careful in the tighter curves and try and maintain a smooth transition with respect to all surfaces. The flap sander was surprisingly effective and MUCH faster than the alternative (the rasp, I don't have a spokeshave). Slow and steady was the name of the game as you can't put the wood back! 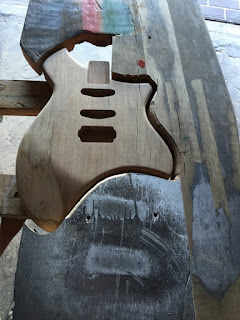 Once I'd completed that task, the body was starting to look like a real guitar. 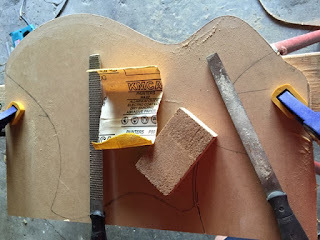 It's essential that the edge rounding is done on the front and back sides of the guitar before the contour step as the edge rounding provides a consistent rounded edge around the body and even though you will destroy that consistent edge in the places where the angle grinder goes to work, you still have a guide for what the edges should look like. 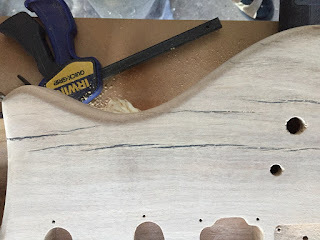 It would be almost impossible to apply the edge rounding after the contours were cut out because the substrate for sections where the router would travel would have been removed. The contours were based loosely on the contours of a standard Strat although given the variation in the shape, feel slightly different. Much better than just rounded edges though. It looks like I cut it pretty fine on the back leg slot on the table top but I actually gave myself plenty of room for the jigsaw. 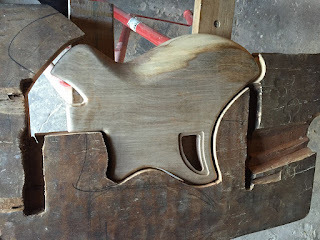 Given how hard the wood was, the jigsaw blade had a tendency to angle back into the work as the blade travelled around the curves in the template. The next step was drilling out the holes for the neck screw buttons. 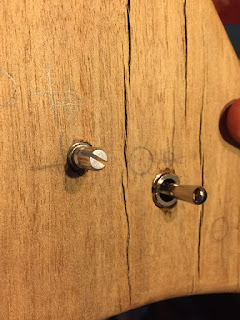 The buttons are flat on the bottom so the critical measurements were the circumference size, (there appears to be no standard between suppliers) and the depth to drill the hole. I must have drilled a dozen holes in scrap to get the hole just right. I don't have a real drill press so I just used the portable drill stand that I had. The amount of movement in the drill stand in the picture is huge so I had to be extremely careful, however the stand did provide a stop to the depth of the hole. A sharp spade bit did the job. I knew I wanted to round the heel, so I offset one of the holes to allow for the rounding. Then using a rasp, I shaped the heel and finished it up with sandpaper. There was very little space for the drill stand and considering the movement in the stand, the result turned out pretty well. From there I lined up the neck in the neck pocket and clamped it to the body. 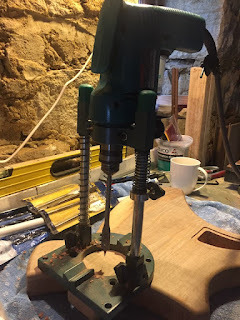 I already had a guide for the drill holes from the spade bit's centre spike so using extreme care with the depth, I hand drilled the holes through the body and into the neck. 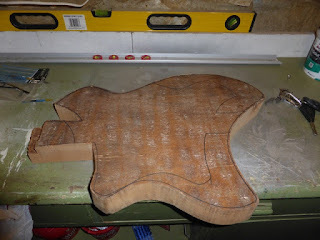 Then with great anticipation, screwed the neck onto the body. The bridge mounted and strung with the saddles set to minimum. The action was way too high. You could limbo under that! 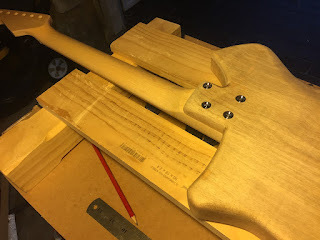 After the neck was attached and the guitar was playable, it was time to drill out the body. That includes the holes to screw on all the hardware and the hole for the wiring. On guitars with pick guards this is not an issue as a channel is typically routed between the pickups. 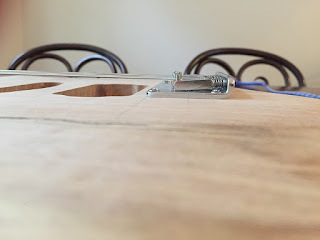 For this guitar a hole had to be drilled for the wiring. I found a cheap drill on AliExpress (actually bought two, the first had a hard time going through melted butter) but this one was excellent. And long. Really long. Rather than try and angle the hole I decided to just drill straight through from the neck pocket, even though the neck side hole was not required. Though the drill out and pre-paint assembly is tedious, it's absolutely essential, due to little issues like this. The cracks in the body are obvious and I REALLY like them. In order to preserve the cracks so that they looked authentic when I applied the wood dye, I tried to fill them in with something clear to maintain the look of the crack. I didn't really want to use wood filler because that always looks naff. I tried clear Araldite, wood glue and finally settled on many, many coats of clear nail polish. In the end I got it sanded back but it was a challenge. As the nail polish was sanded it would start to expand and go gummy. Frustrating. 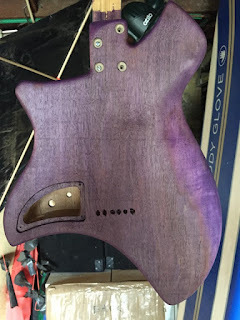 In my head I had a picture of a dyed purple guitar with the grain of the wood shining through, but after the first coat of the wood dye I was wishing I had just left it as a plain wood finish. Though it's not that noticeable from the photo, there was a section of the wood that loved the dye and went bright purple. 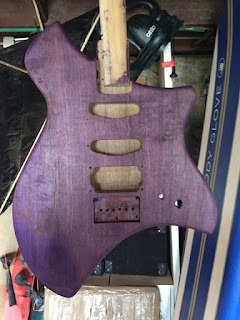 The rest of the body turned a pretty mundane purple-ish wood colour. In the end it may have come out alright for most of the body but I didn't want the bright purple shiny patch messing with the finish. So I decided to paint. I struggled with the paint. I originally though that the more coats the better but after a while the surface degrades with the thickness and you start to lose the gloss. Paint is not easy. 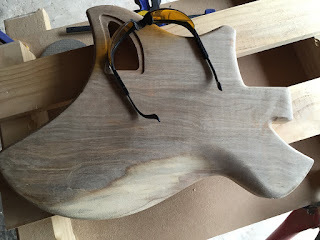 You need to sand the wood back to glass smoothness. Paint a generous coat of primer/sealer, then sand that back to glass smooth. Then it should just be two coats of colour and two coats of clear. More coats is NOT better. I also should have built a dedicated stand that allows you to paint with the spray can upright for the face and back of the body. Instead, I painted with the body flat and angled the can. Not ideal. Follow the instructions on the can re distance to hold the can from the job. Different paints dry more quickly through the air and you don't want dry paint hitting the job. Do the second coats as soon as possible after the first so that they meld together. Wait between the colour and the clear coats. Auto paint is excellent for the colour coats particularly the pearl or mica finishes. I just used the touch up spray cans for colour and a spray on 2-pak clear for the clear coats. Standard acrylic does not dry as glossy. 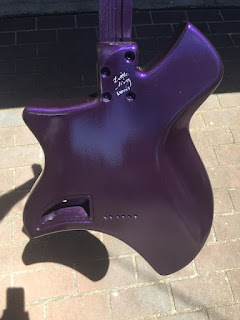 Once the paint dried, it was just a matter of re-attaching the hardware and the neck and getting the guitar ready for final setup.